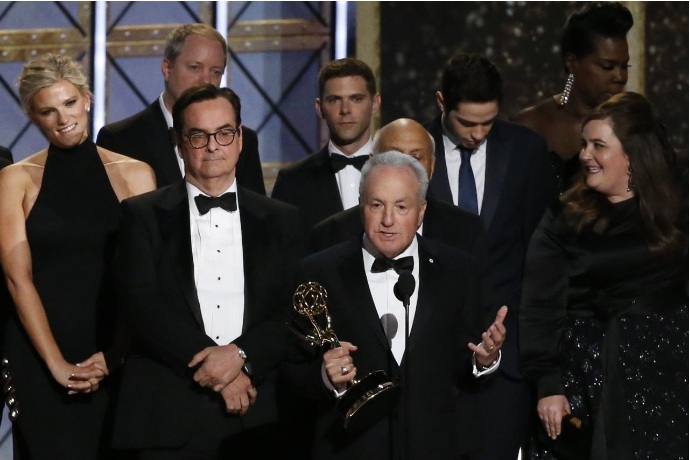 69th Primetime Emmy Awards – Show – Los Angeles, California, U.S., 17/09/2017 - Lorne Michaels accepts the award for Outstanding Variety Sketch Series for "Saturday Night Live." 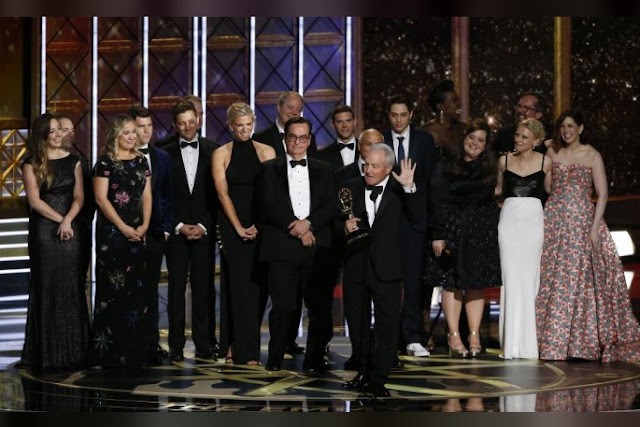 LOS ANGELES - Satirical sketch show ”Saturday Night Live’ took the Emmys by storm on Sunday, winning three early awards in a ceremony marked by multiple jabs at U.S. President Donald Trump. After the show’s most-watched season in 23 years, Alec Baldwin won the comedy supporting actor Emmy for his withering impersonations of Trump, while Kate McKinnon was a winner for her spoofs of his presidential election rival Hillary Clinton and White House aide Kellyanne Conway. “Saturday Night Live,” which airs on Comcast Corp’s NBC, also won the Emmy for best variety sketch series, while Melissa McCarthy’s turn as former White House press secretary Sean Spicer won her an Emmy last week. Spicer, who resigned in July, was a surprise guest at Sunday’s Emmys, appearing with his podium to declare that the Emmys telecast would attract the largest audience ever. Period. Trump loomed over the ceremony. Colbert joked about Trump’s multiple Emmy nominations but zero wins for his reality shows “The Apprentice” and “The Celebrity Apprentice,” before he decided to run for the White House. “If he had won an Emmy, I bet he wouldn’t have run for president,” Colbert told the A-list audience. “It’s your fault! He never forgave you and he never will. But unlike the presidency, the Emmys go to the winners of the popular vote,” Colbert quipped, referring to the 2016 election result. Backstage Baldwin said he would be reprising his Trump role in the upcoming new series of “Saturday Night Live,” describing his impersonation as an outlet for Americans who cannot come to terms with Trump’s election. “I find myself a conduit for them. They are very frustrated, they are suffering a great deal,” he said. Female-driven murder drama “Big Little Lies” was another big winner, taking early limited series awards for supporting actors Laura Dern and Alexander Skarsgard, as well as for director Jean-Marc Vallee. The absence of two-time Emmy champ “Game of Thrones” because of a later broadcast date has opened the door to new shows in the coveted best drama series. “The Handmaid’s Tale,” author Margaret Atwood’s dystopian tale of a society where women are forced into sexual servitude, led the early Emmys, winning for writer Bruce Miller, director Reed Morano and supporting actress Ann Dowd, who plays a brutal den mother. Alexis Bledel took home an Emmy last week for her guest turn as the defiant Ofglen and “Handmaid’s Tale” lead actress Elisabeth Moss is favorite to win her category later on Sunday. Satirical sketch show ”Saturday Night Live’ took the Emmys by storm on Sunday, winning three early awards in a ceremony marked by multiple jabs at U.S. President Donald Trump. After the show’s most-watched season in 23 years, Alec Baldwin won the comedy supporting actor Emmy for his withering impersonations of Trump, while Kate McKinnon was a winner for her spoofs of his presidential election rival Hillary Clinton and White House aide Kellyanne Conway.